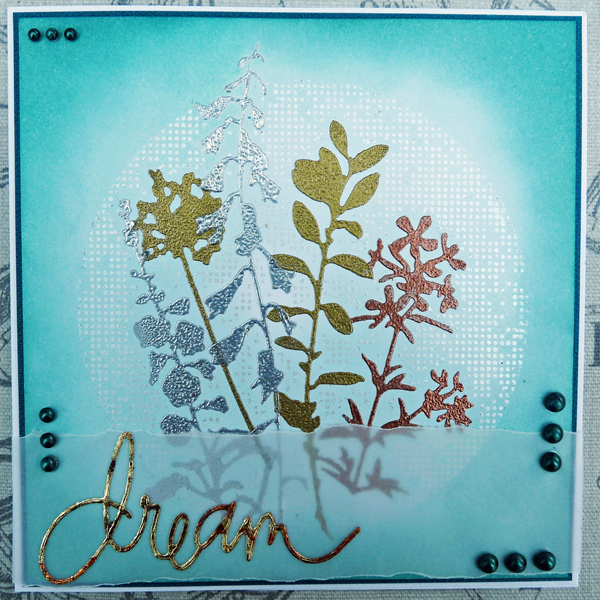 Project Description: This card uses the Double Tack Mounting Film and Artist-tac adhesive sheets to add color, texture and act as a resist to make this dreamy card. 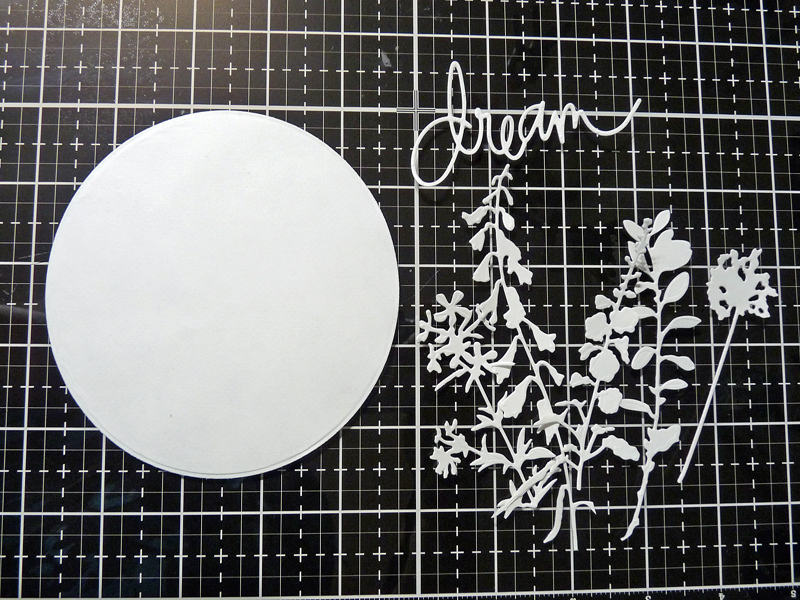 Cut 5 floral shapes and the word from the Double Tack adhesive sheet and a 4 ½” diameter circle from the Artist-tac. Treat the 5 ½”x5 ½” White card with the anti-static bag. 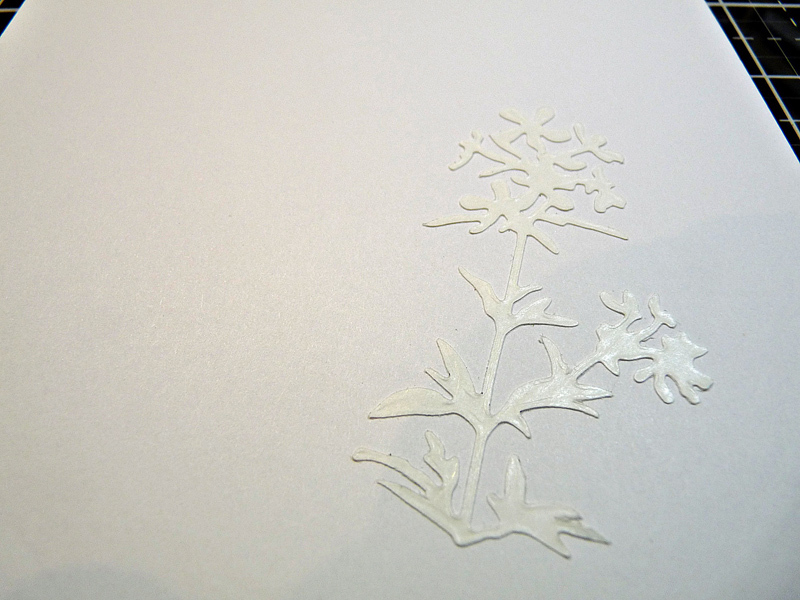 Adhere one of the floral shapes onto the 5 ½”x5 ½” white card. Remove the backing sheet to expose the adhesive- retain the backing. 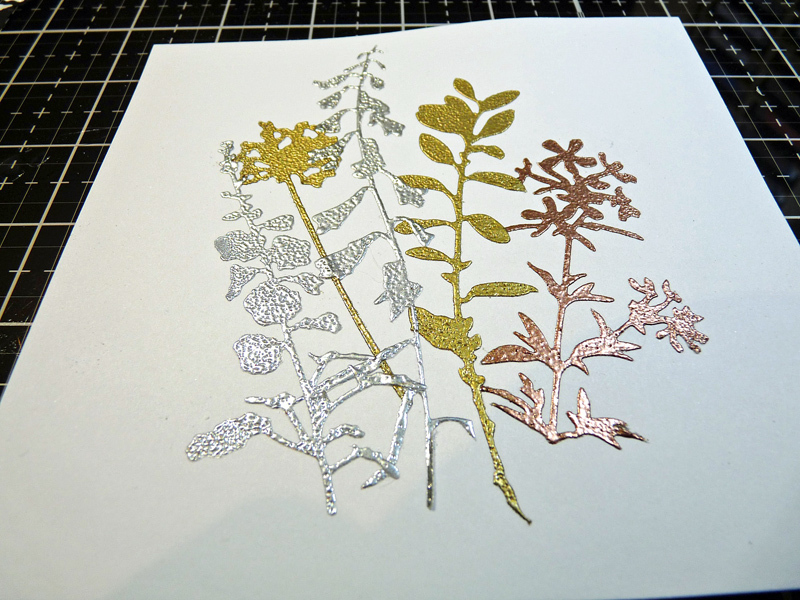 Cover with bronze embossing powder, remove the excess. 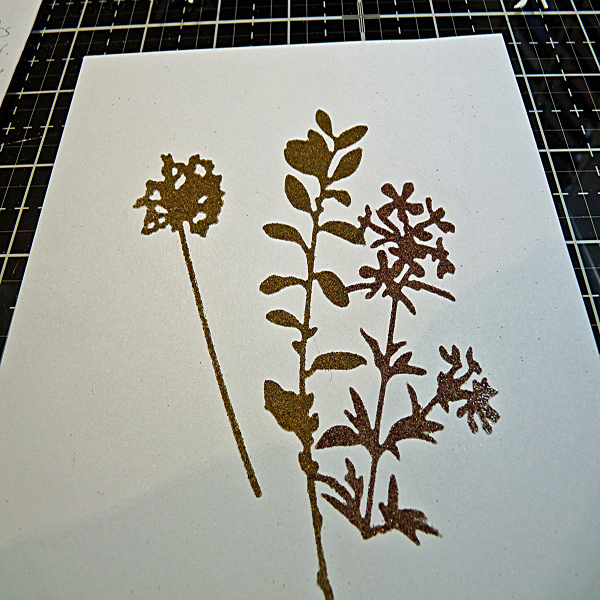 Repeat step 3 with two more floral shapes, this time use gold embossing powder. 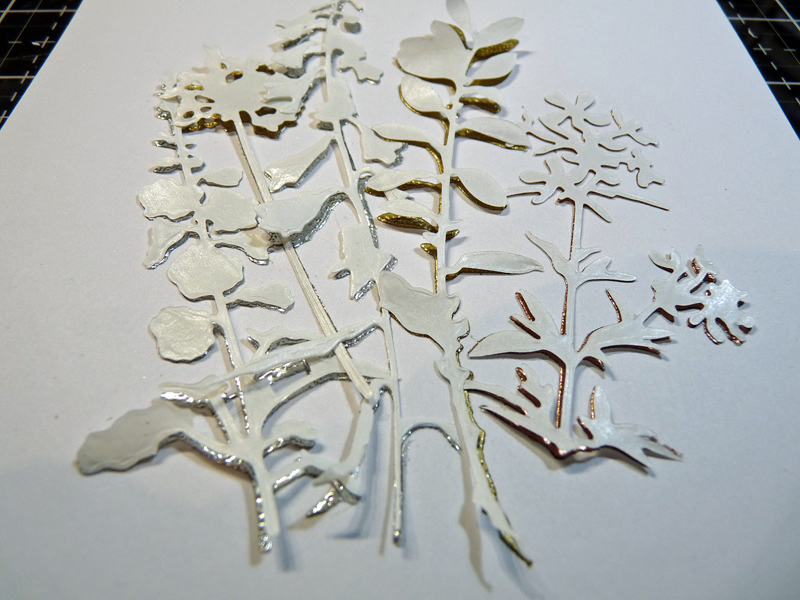 Again repeat step 3 with the last two shapes using silver embossing powder. 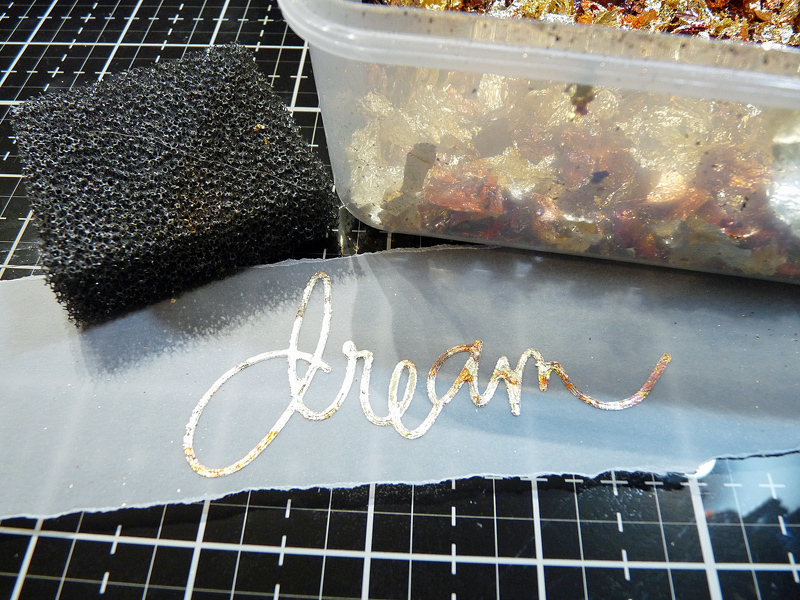 Heat the embossing powder with craft heating tool to melt. Replace the retained backings over the embossed images. 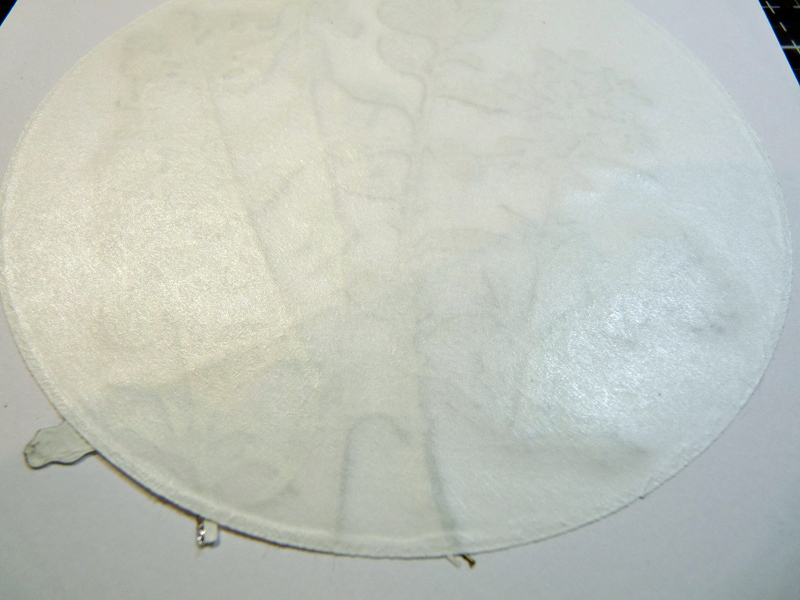 Place the Artist-tac circle over and lightly burnish- I used a soft cloth to make sure there were no marks. Then remove the backing and brush the white mica pigment powder over and remove any excess. Sponge the Distress Inks around the edge of the white card and blend into the center over the mica powder and embossed images. 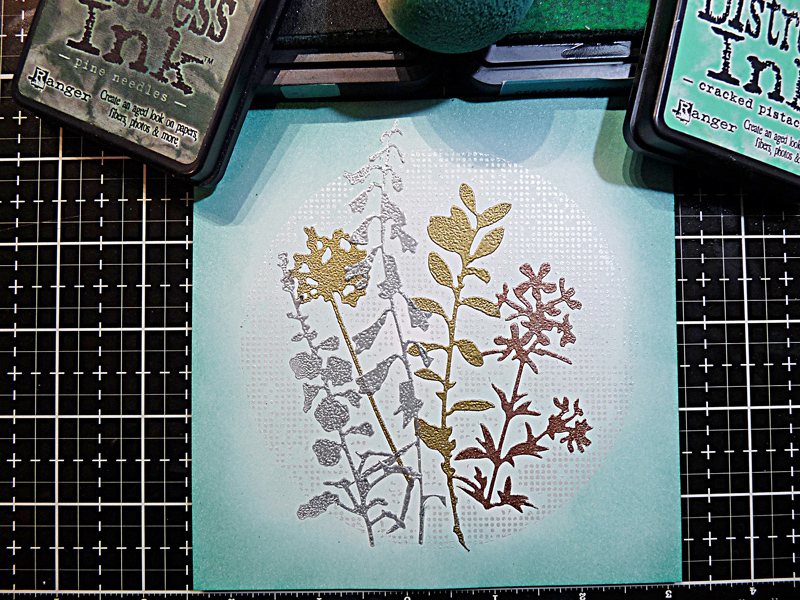 Adhere this panel to the 5 ¾”x5 ¾” dark teal card and then onto the card blank leaving an even narrow border around each. 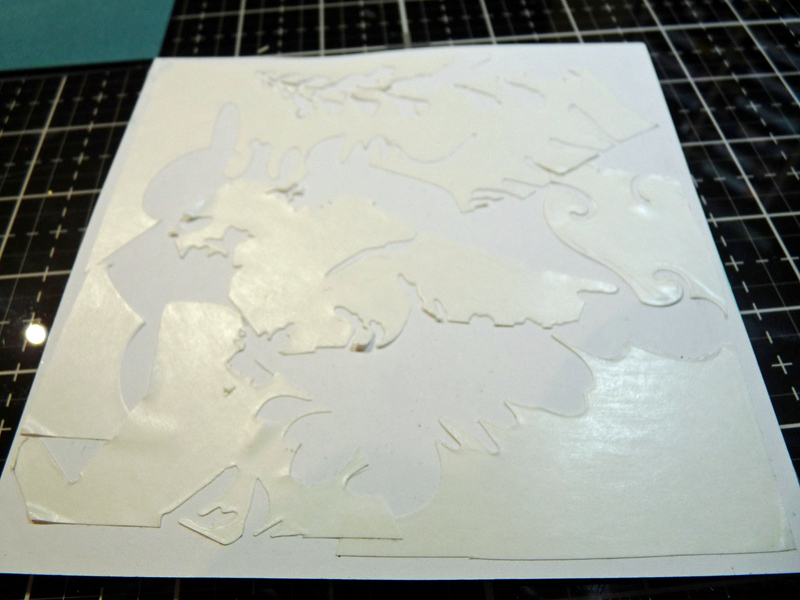 Tear a strip of Vellum and stick the die cut word down and expose the adhesive. 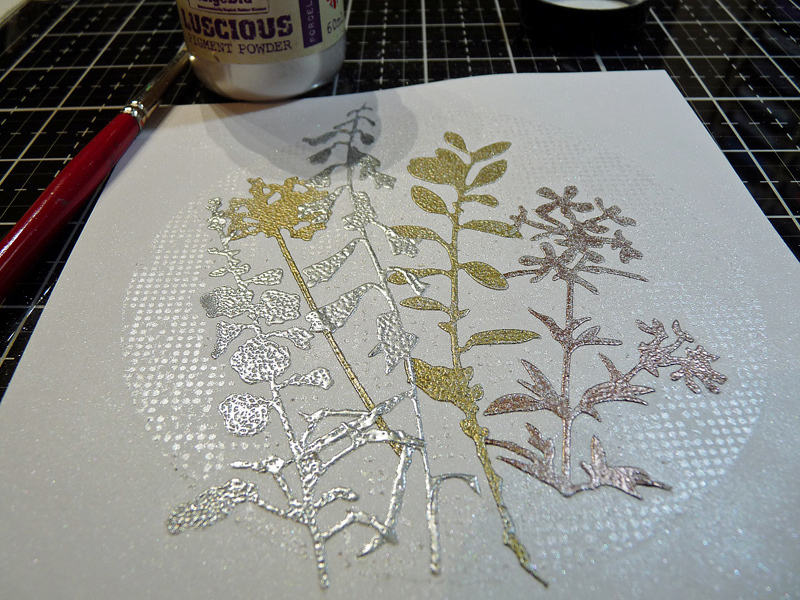 Cover with the Metallic gilding flakes. 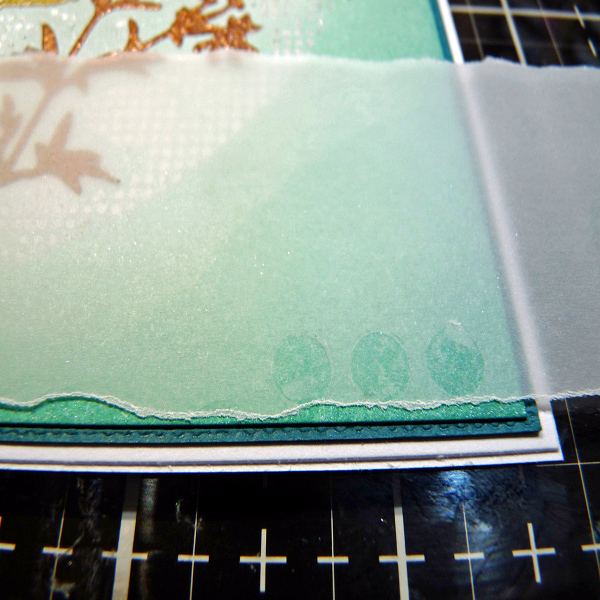 Punch small circles from the Double Tack Mounting Film and use to attach the Vellum strip to the front of the card, trim as necessary. Add the adhesive pearls over each circle. 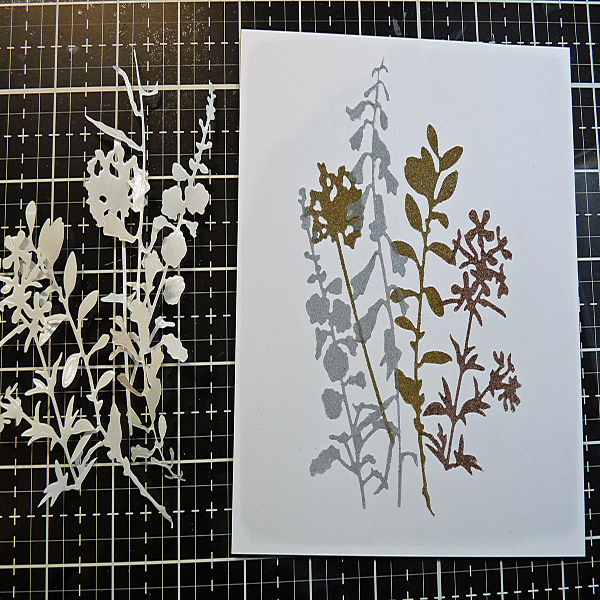 Note- you can use the excess from the floral cuts to maximize the use of each sheet.